Lupin’s commissioned to tutor a little tike in the art of thievery only to discover that lascivious luster cannot be taught. The boy’s great at everything except getting it on. 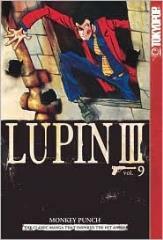 And next, Lupin learns that he cannot outrun fate; no matter how lackluster his schemes to rob, he is destined to steal.